Jennifer Peifer and pastor Isaac Villegas confer after worship. 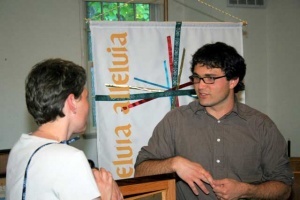 Chapel Hill Mennonite Fellowship (CHMF) evolved from a Chapel Hill-Durham small group within the Raleigh Mennonite Church, augmented by other Mennonites living in Chapel Hill and Durham, North Carolina. The group of about 20 persons began to hold one worship service per month in November of 2001. On 22 September 2002, Raleigh Mennonite Church gave CHMF official recognition as a separate body, and CHMF, by then worshiping weekly, had its first communion that evening. The congregation was self-generated, i.e., without the efforts of a church planter. Thus the congregation’s character was largely shaped by the experiences and convictions of its members. Sermons were initially provided by two doctoral students of the Graduate Program in Religion at Duke University and three other members of the group. In 2005 the congregation published A Word in Season, How Good It Is!, a Christian year in sermons by eleven preachers from the Chapel Hill Mennonite Fellowship. It was edited by Thomas Lehman and published by Rosenberry books, whose principals were then members of the congregation. In May 2006 CHMF engaged Isaac Villegas as half-time pastor; he had graduated from the Duke Divinity School that month, and had worshiped with the congregation during most of his three-year MDiv program. Prior to that time most of the planning was done by members, more than half of whom offered to serve on the original worship committee. In 2010 Isaac Villegas, employed .75 time, preached about half the time; other Sundays were assigned to one of several members. This yielded diversity within unity, and worked well. The Revised Common Lectionary was the basis of worship. On 8 February 2004 CHMF held a membership service with 22 charter members. This step was preceded by serious discussion; one member asked why, when things were going well, the group should bother to establish a formal membership list. Because of the close proximity of CHMF to two major universities (University of North Carolina and Duke University), there has been a marked transitional element to the composition of the congregation. Of the original 22 members, exactly half had left by 2010. Five years after its charter membership service, CHMF had 27 active members and an average Sunday attendance of about 40 persons. The congregation has met in the Meeting House of the Chapel Hill Friends Meeting, located next to the University of North Carolina campus. Sunday worship began at 5:00 p.m. The pastor carried the congregation’s cell phone; there has been no land line phone and no postal address. The order of worship for each Sunday can be found in the archives of the Eastern Mennonite University Library. Most sermons are posted to the congregation's website. In addition to its pastor, the congregation in 2015 had a moderator, a treasurer, a secretary, four deacons, and committees for committees for worship planning, financial matters, hospitality, building, and children. Lehman, Thomas. "Chapel Hill Mennonite Fellowship (Chapel Hill, North Carolina, USA)." Global Anabaptist Mennonite Encyclopedia Online. January 2015. Web. 22 Apr 2019. http://gameo.org/index.php?title=Chapel_Hill_Mennonite_Fellowship_(Chapel_Hill,_North_Carolina,_USA)&oldid=162851. Lehman, Thomas. (January 2015). Chapel Hill Mennonite Fellowship (Chapel Hill, North Carolina, USA). Global Anabaptist Mennonite Encyclopedia Online. Retrieved 22 April 2019, from http://gameo.org/index.php?title=Chapel_Hill_Mennonite_Fellowship_(Chapel_Hill,_North_Carolina,_USA)&oldid=162851. This page was last modified on 21 December 2018, at 16:45.